Trade Minister Faiyaz Koya held discussions on investment, trade and tourism with the new Chinese Ambassador to Fiji in a courtesy call on Tuesday. 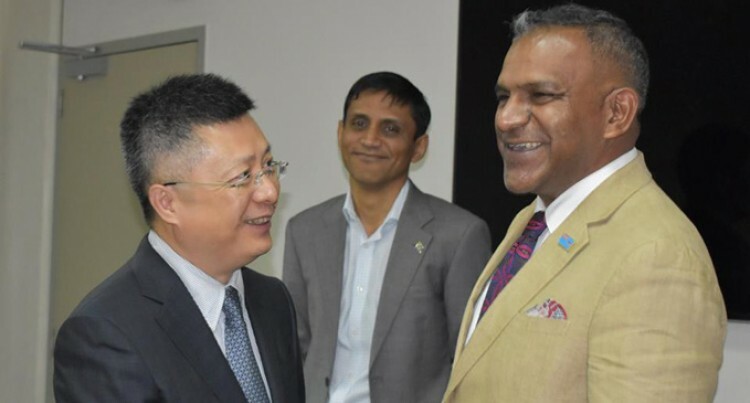 Mr Koya, who is also the Minster for Industry, Tourism, Lands and Mineral Resources, in receiving Ambassador Qian Bo, spoke highly of China-Fiji relations, according to a Government statement. Both parties, the statement said, agreed to further enhance the existing bond through collaborative efforts in the areas discussed. The statement said Ambassador Bo spoke of a need for balance while securing bilateral interests between the countries. Mr Bo said his duty was to safeguard national interests while promoting Fiji in China. He called on Fiji to maximise on the benefits from an international Import Expo that will be held in China this November. It says the country expects to import more than $USD10 trillion (FJD $20.35tr) worth of goods and services in the next five years. The nation’s transformative One Belt-One Road economic development initiative was also part of the discussions with Mr Koya. The statement said the Ambassador also highlighted his agenda to help facilitate the One Belt-One Road Initiative to the Fijian National Development Plan and other reforms undertaken by the Fijian Government. A senior academic told Xinhua this month that the initiative has advanced trade liberalisation to benefit both developed and developing countries. “The Belt and Road Initiative is intended to integrate markets, promote infrastructural development and co-operation,” University of the South Pacific economics lecturer Neelesh Goundar told the news agency. Other areas discussed included co-operation in sectors such as agriculture, technical expertise and capacity building.